When you’re busy, it’s easy to use the drive-thru or work cafeteria as your default lunch venue leading to unhealthy and fatty food selections each day. Break the cycle and begin packing these healthy lunch recipes to work. This French-inspired wrap packs plenty of flavor but is a leaner and meaner version of your deli favorite. A side or fresh raspberries or blueberries will polish off this nutrient-rich meal. Combine first 6 ingredients in a large bowl, tossing to coat. Spread 1 tablespoon Boursin cheese over each tortilla. Top each tortilla with 6 slices cucumber, 3 slices tomato, and approximately 2 ounces turkey. Divide slaw mixture evenly among tortillas; spread on each and roll up. Cut each rolled wrap in half diagonally. Wrap each tortilla in plastic wrap. Does your stomach grumble every day at 4 p.m. on the dot? The combination of whole grains and protein in this salad will keep your energy up throughout the afternoon. Give your pasta a health makeover with this simple make-before recipe. Heat olive oil in a large nonstick skillet coated with cooking spray over medium-high heat. Add garlic; sauté 30 seconds. Add shrimp; sauté 1 minute. Add tomato and basil; reduce heat, and simmer 3 minutes or until tomato is tender. Stir in kalamata olives, capers, and black pepper. Combine shrimp mixture and pasta in a large bowl; toss well. Top with cheese. Throw this wrap together in 10 minutes, right before you jet out the door. Pair it with a tart Granny Smith apple and you have a delicious, nutritious lunch. 1. Combine cheese and mint in bowl. 2. Wrap tortillas in paper towel. Microwave on HIGH 20 seconds. 3. Spread each tortilla with 2 tablespoons cheese mixture. Divide peppers evenly among tortillas; sprinkle with salt. 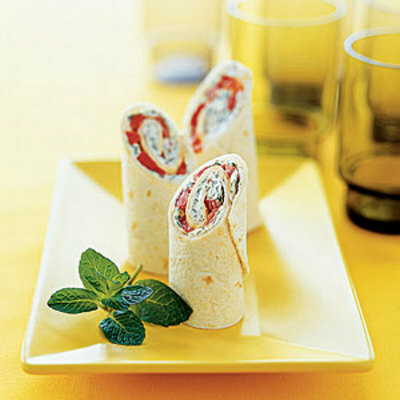 Roll up tortillas; wrap each tightly in plastic wrap, twisting ends to secure. Chill 1 hour. 4. Unwrap tortillas. Cut each wrap into 4 pieces, cutting one end of each piece diagonally and one end straight across so the piece can stand on end (see photo above). On the way home from work, stop by the deli and grab some roasted chicken to make this tropical-flavored sandwich. This sandwich is a little light on veggies, so pack a mixed-greens salad to sneak in a few leafy greens.